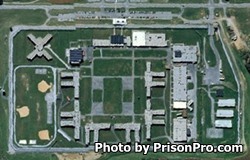 Roxbury Correctional Institution is located in Hagerstown Maryland. It is a medium security prison that houses approximately 1,701 adult males. Inmates at this facility have an average incarceration term of 7 years. This facility participates in the Maryland Correctional Enterprises employing inmates in jobs including file folder and envelope production, Maryland motor vehicle administration and registration stickers. Inmates also work in a recycling plant, and provide agricultural services harvesting crops. Offenders can earn a GED while incarcerated and can participate in a variety of vocational training. Vocational skills taught at Roxbury Correctional Institution include vehicle maintenance, masonry, building maintenance, and carpentry. Visits are a maximum of one hour in duration, and inmates are allowed two visits each week (segregation inmates are allowed a single visit each week). Visiting occurs on Fridays, Saturdays, Sundays, and Mondays from 8am-2pm. You must arrive and register by 1:30pm or you will not be allowed to visit. The maximum number of visitors an inmate can have at once is three adults and three children.